Australian Jewish Nobel Prize Winners Click on the 1903 flag in top left corner to return to index page of Jewish History Australia. 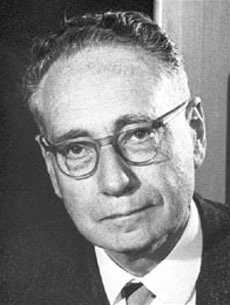 Sir Bernard Katz gained the 1970 Nobel Prize for Physiology or Medicine for his work on neuromuscular transmission. Born in Leipzig, Germany, in 1911, he fled the Nazis to come to London in 1935, where he gained his PhD. In 1939, then stateless, he came to Sydney to work with the renowned John Eccles in neuromuscular research. He became a naturalised Australian in 1941, and for the remainder of the War served in the Royal Australian Air Force. He returned to the UK in 1946. Easily the best short biography of Sir Bernard Katz(1911-2003) is the obituary by John Carmody , which reports how experiences of anti-semitism in Germany lead "the young Katz to become an enthusiastic Zionist". The number of Australian Nobel Prize Winners has been (arguably) counted as ten according to this discussion. Amongst the ten is the one Australian Jew who has gained a personal Nobel Prize, Sir Bernard Katz, an Australian citizen who served in the RAAF, whose Sydney research was part of the corpus of work for which he was awarded the Nobel Prize. Whereas the Nobel Prizes for literature and the sciences are generally awarded to individuals, sometimes jointly with one or two others, the 2007 Nobel Peace Prize was awarded jointly to an organization, the Intergovernmental Panel on Climate Change (IPCC), and to Al Gore, the former US Vice president. THE IPCC gained the Nobel Peace Prize for its vital series of reports 2001-7 on climate change issues. Dr Tom Beer was a lead author for the IPCC Special Report on Technology Transfer and a panel member on the Expert Panel on GHG emissions from waste. He was also a reviewer for the Australian Climate Impacts section of WG2. The Citation which the IPCC presented to Dr Beer to mark his participation in the award is below. 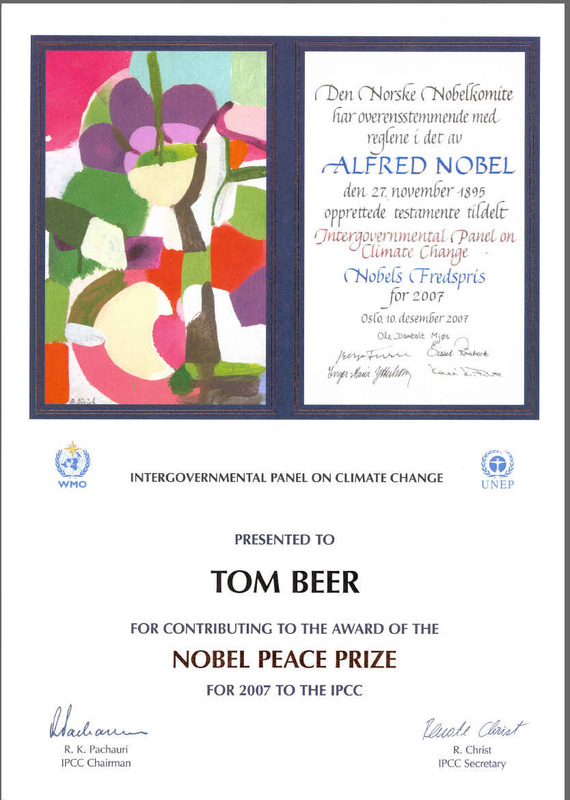 The upper portion of the Citation awarded to Dr Tom Beer is a duplicate of the Nobel diploma awarded to the IPCC. The International Panelon Climate Change, the IPCC, presented like Citations to all who contributed to preparation of the studies for which the IPCC gained the Nobel Peace Price 2007, whether they be lead authors, referees, or served as panelists. It is estimated that one hundred to two hundred Australians received such Citations, a number of whom would be Jewish. 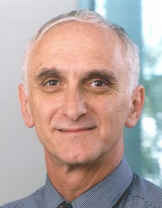 Dr Tom Beer, is of special prominence as one who contributed as lead author and in other ways. He is President of the International Union of Geodesy and Geophysics, and leads the Transport Biofuels Stream within the CSIRO, (The Commonwealth Scientific Industrial Research Organization), Melbourne. Dr Beer came to Australia from Hungary in the early 1950's as a young child. He is a former president of the Leo Baeck (Progressive) Synagogue in Melbourne. It is well worth remarking that the rabbi of this synagogue, Rabbi Jonathan Keren-Black, trained as an engineer, and in 2004 was a founder of JECO the (Australian) Jewish Environmental Coalition. The New Zealand Story As Jews amount to about 0.1% of the New Zealand population, it is not surprsing that no New Zealand born or educated Jews have won a 'personal' Nobel Prize. In fact, just three New Zealanders, Ernest Rutherford (1907), Maurice Wilkins (1962), and Alan MacDiarmid (2000) have been awarded such Nobel Prizes. However, with the award of the 2007 Nobel Peace Prize to the Intergovernmental Panel on Climate Change (IPCC), a further 28 New Zealanders achieved the status of Nobel Laureates as recipients of a "shared" Nobel Prize. The IPCC acknowledged the outstanding contribution to the Award of the 2007 Nobel Peace Prize of the New Zealand climate scientist Dr Jim Salinger. Dr Salinger was a lead author for the scientific assessment of climate trends in the 2001 IPCC report and was lead author for climate impacts in the Australia-New Zealand chapter of the fourth assessment. Dr Salinger who is a Principal Scientist with the NZ NIWA ( National Institute of Water & Atmospheric Research aka Taihoro Nukurangi ). was elected President of the Commission for Agricultural Meteorology of the World Meteorological Organization (WMO) in 2006. Dr Salinger is a member of Beth Shalom, the Progressive Jewish Congregation of Auckland, NZ. In classic paper published in Nature in 1975 Salinger showed a warming trend in the Southern Hemisphere in the absence of land based pollution; this paper boldly suggested that the warming then emerging over land in the Northern Hemisphere was not due to pollution but rather was due to a greenhouse gas (GHG) effect. To the left is a plot that Dr Salinger produced of long-term average temperatures in New Zealand. This plot was produced from the raw data by making (somewhat arbitrary) corrections to the raw data based on the changed location of the temperature sensor used. Dr Salinger was dismissed from his role in the Crown Research Institute NIWA (National Institute of Water and Atmospheric Research in April 2009 for making unauthorised comments to the media. More precisely, The Nobel Prize in Physics 2011 was divided, one half awarded to Saul Perlmutter, the other half jointly to Brian P. Schmidt and Adam G. Riess. To be even more precise -- what was divided was the monetary prize that was awarded, but each Nobel Laureate will receive (one) medal and diploma. This is the first time that the Nobel Prize in Physics has been awarded for work that could be characterised as astronomy or as that branch of experimental physics concerned with Cosmology. Its noteable that the great astronomer Hubble was NOT awarded the Nobel Prize, because of a narrow definition of Physics then being applied by the Nobel Committee.